Hello, in this post we will discuss the detailed explanation on PF admin charges. Here, we will cover the meaning, calculation and the revised administrative charges. 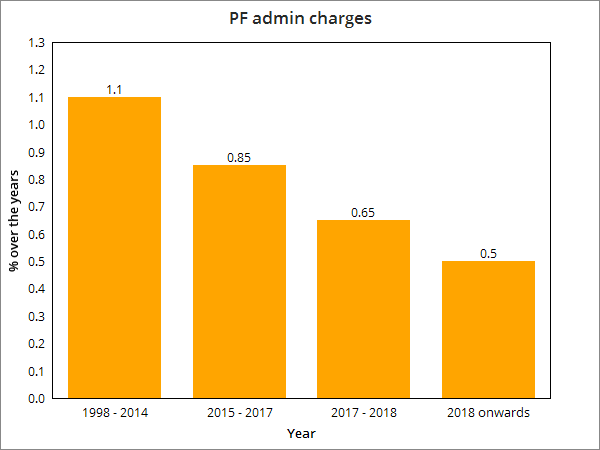 What are PF admin charges? Employee – 12% of Employee Provident Fund (EPF). Note: Minimum contribution Rs. 500 or Rs. 75 for non-contribution of PF admin charges. EPFO has reduced the administrative charges from 0.65% to 0.50% w.e.f June 1st, 2018 and waived off admin charges for EDLI scheme. In this example, we have considered one PF contributing employee whose Basic+DA = 15,000. This completes our blog of PF/EPF admin charges. If you have any questions, drop them in the comment section below. Did you know you can automatically deduct PF admin charges in our payroll software? Check out Saral PayPack for more details. Dear Sir, w.e.f 1st April 2017, Account No. 22 – EDLI Admin Charges is waived off. EPF office in Chennai Royapettah is insisting for 0.5% or minimum of Rs.500 (whichever is higher) as administrative charges. Please clarify whether they or right. Yes Sir, it is right. Adm. charges are not deducted from salary. They are borne separately by the employer. The admin charges should be 500. Am I correct understanding that.? But, the ECR receipt challan is showing Rs. 8,105/- as EDLI contribution amount. How? please advice. The EDLI contribution is the account on each employee share rounded off to the nearest rupee. This may be the reason for the difference of amount shown. Thank you Sir. With this month’s payment, i got to know that, as you have mentioned, the difference is due to the rounding off. Is A/C no. 2 of 0.5% on the Total gross wages OR total EPF wages? or Is it also calculated on account of each employee share rounded off to the nearest rupee? is it compulsory to pay admin charges while filing return only for two employees?as Rs.500?Please help. Yes, it is compulsory to pay admin charges while filing the return for 2 employees. Apart from admin charge there is inspection charge too, is inspection charge is mandatory for employer or not. Hi Sir. The PF admin will be charged at 0.5%. If I generate more than 3 challan in a month then is it compulsory to pay administrative charge for every challan? Sir you told Adm. charge for EDLI scheme is waived off from June 2018. Then Why you show it in the table “calculation of PF administrative charge’? it is confusing. Yes.. each payment will attract the Admin charges based on the amount of contribution. EDLI Contribution (Account No. 21) will be 0.5% on each employee’s pay. Whether EPF Administration Charges (Account No.2) is also calculated at 0.5% on each employee’s pay OR on the total wages? Please advice. Account No. 2 is calculated on the total wages. Please advise if there is any penal damages for paying less than the Minimum Admin charges of Rs. 500/- For Eg: We paid throughout 17-18, PF Admin charges less than 500 and EDLI admin charges less than 200. So want to understand that PF office will ask for any interest or penalty on this less payment. Dear Sir, Our two staff respectively have actually left our service on 30-09-2018 and due to clerical error the PF dues have been remitted for them up to 31-12-2018. what shall we do sir? How can i file the EPF Return for the EPF salary of above Rs.15,000/-.i.e.I need to pay PF amount of morethan Rs.1,800/- P.M.How can i file the return, its getting error when i file it, If i have entered above 15,000 EPF salary.Please help on this regard. you can use a software to generate the required return formate and upload it to the PF Employer Login. Else, you can also do the manual entry in PF Employer login and submit the details. Please note that PF admin & EDLI is charged to the employer and not to the employee. Hence, you are not required to pay the same. A/C no 1: PF contribution account 3.67% 15000*0.0367=550.5 – Do we need to rounded off this to nearest value which is 551!! A/C no 10: EPS account 8.33% 15000*8.33%=1249.5-Do we need to rounded off this to nearest value which is 1250!! Now. whether PF is considered at 15000*12% (OR) 15000/30*27 *12% i.e; is it Rs.1800 (OR) Rs.1620 ? In the ECR file, in the column of Gross wages, should I mention Rs. 50,000/- (OR) Basic +DA only ? we have the exempted pf trust .pf admin charge is calculation on 15000/- or actual gross salary. Admin Charges are calculated on Actual PF Wages on which PF is calculated. For the year 2016, Minimum amount for account 22 is Rs. 200. From April 2017, it is ZERO. Can some one clarify : Are “Administrative Charges” payable Separately on both the Components of Provident Fund Contributions i.e; Separately on Employers Contribution and Separately on Employees Contribution. for example: Rate of Admn. Charges( e.g; 5%) /100 X Employers Contribution & 5%/100 X Employees Contribution. Is it chargeable in total by taking Employers Contribution and Employees Contribution as a Single Component. For example : 5%/100 X Employers Contribution + Employees Contribution. OR : 10% AS A WHOLE ON ON EMPLOYERS AND EMPLOYEES CONTRIBUTION. I AM FROM J&K STATE, THERE MAY BE VARIATION IN ADD ONS. hi, I want to know the calculation of PF damage and Interest. kindly explain with an example.